• Sunday, November 4, 9:00 am-2:00 pm National Conservation Training Center, Shepherdstown, WV (in conjunction with the Chesapeake Watershed Forum). • Tuesday, November 13, 10:00 am – 3:00 pm at Augusta County Public Library—Main Library, 1759 Jefferson Highway, Fishersville, VA 22939. Register here. • Thursday, December 13, 10:00 am – 3:00 pm at Farm and Home Center (Multipurpose Room), 1383 Arcadia Road, Lancaster, PA 17601. Register here. Learn the tricks of the trade from the Chesapeake watershed’s most successful conservation fie ld people. If you want rural landowners to say “yes” to conservation practices and easements, this course is for you. Part 1: Landowners and Their Perspective. You will explore the demographics of rural landowners, and how they make decisions about conservation practices and easements. Part 2: Negotiations, Start to Finish. In this session, you will learn how to cultivate your personal reputation among landowners, and help them reach a decision to pursue conservation on their property. Part 3: Persistence Pays — and So Does Customer Service. In this session, we explore how top field staff provide good customer service while managing an ever-expanding workload. This workshop includes three 90-minute blocks of information and interactive learning, plus a working lunch. Workshop content is based in part on surveys and focus groups of conservation field staff identified by their peers as being especially effective at working with farm and forest landowners to implement voluntary conservation practices. This training is co-hosted by the Land Trust Alliance and by Virginia’s United Land Trusts (VaULT) and Virginia Association of Soil and Water Conservation Districts (in VA) and by Pennsylvania Land Trust Association (PALTA) and the Pennsylvania Association of Conservation Districts (in PA). This project is a collaboration of Water Words that Work, LLC and the Chesapeake Land and Water Initiative, a partnership of the Chesapeake Bay Funders Network and the Land Trust Alliance. 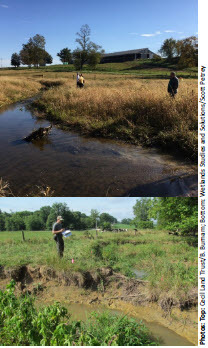 We are grateful for the project support of the National Fish and Wildlife Foundation Chesapeake Bay Stewardship Fund’s Technical Capacity Grants program, funded in partnership with the U.S. Environmental Protection Agency, as well as funding from the Foundation for Pennsylvania Watersheds. Questions? Contact Jennifer Miller Herzog at jmillerherzog@lta.org or 406-580-6410. Eric Eckl, founder and principal at Water Words That Work, LLC, has more than 20 years’ experience planning and executing environmental outreach and communications programs. Eric is a sought-after conference speaker and has appeared on CNN and been quoted in the New York Times. Before starting the firm, Eric worked for Beaconfire Consulting, American Rivers, the U.S. Fish and Wildlife Service, and the Environmental Law Institute. Bobby Whitescarver, Whitescarver Natural Resources Management, LLC, has decades of experience in watershed and wildlife habitat restoration working with farmers. Bobby retired from USDA’s Natural Resources Conservation Service after 31 years in the field. He has extensive experience designing and implementing livestock grazing systems, including fencing and alternative watering systems. He has been involved with more than 500 miles of stream bank protection work, helped landowners plant over half a million native hardwood trees and establish and maintain more than a thousand acres of native prairie, and has successfully brought back the Northern Bobwhite to many farms. Bobby is an Agronomist, certified Nutrient Management Planner, certified Prescribed Burn Manager, and certified Resource Management Planner.